At a time where the relevance of the social sciences is under threat, this innovative book offers a speculative experimentation on the philosophy and methodology of the social sciences to rethink what 'relevance' is, and to cultivate a new ethos of knowledge-making for an eventful world. Engaging a diverse a range of thinkers including Alfred North Whitehead, Gilles Deleuze and Isabelle Stengers, as well as the American pragmatists John Dewey and William James, Martin Savransky challenges longstanding assumptions in the social sciences and argues that relevance is an event that is part and parcel of the immanent and situated processes by which things come to matter. 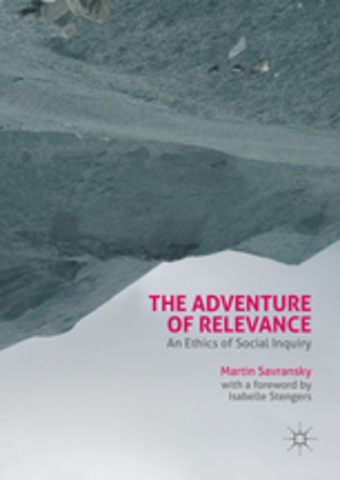 He develops new conceptual tools for cultivating an empiricist ethos of inquiry that is attuned to the question of how things come to matter– an ethics that turns social inquiry into a veritable adventure. The result is an original and rigorous book that infuses knowledge-practices in the social sciences with new sensibilities, creative possibilities, and novel habits of thinking, knowing, and feeling.